The Sd.Kfz.222 was a small 3 man armoured car that became the standard light armoured car of the German armed forces. It was in service before WW2 and was used up to the end of the war. It was armed with a 20mm cannon + a machine gun and was used for reconnaissance by the German army and the Waffen SS. This is a highly detailed plastic kit with photo etch metal parts. 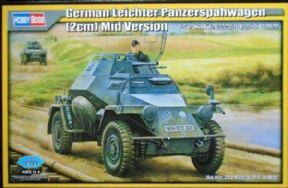 There are markings for 2 different German Army vehicles.